Few people I can ask would disagree with the idea that the Nuclear Age and the Space Age arrived together, perhaps pinpointing their twin origin to the levelings of Hiroshima and Nagasaki. Shortly after, I remind them, visitors from some other realm crashed their ride on the outskirts of Roswell and we’ve been party to a stream of crashers ever since. We did that, of course –blew up a couple of cities with enough force to jettison a pulse beyond our solar system and ring the Cosmic doorbell. Oops. Little did the people of the Earth realize at the time that “this event..changed mankind’s status in the universe forever.” [p140, Energy and Conflict]*. Collectively, we became the extraterrestrials by “this event”, endowed with the power of intention and scientific prowess to physically reach into off-world domains. The situation of creating The Bomb and testing it made that true even had it never been used in war. The Cyborg Handbook explains: “Man learns to position himself physically as an extraterrestrial observer looking back on his earthly womb and matrix…” And from this vantage point, the “extraterrestrial perspective”, developed the metaphor: “Man is, by self-definition, a globalizing and therefore global species. The people who built the..physical technology to see ‘Gaia’ became the global species.” [p.xiv, foreward] Indeed. Aliens-R-Us. We’ve been using the language for millenia. The New World of the forever-changed Man is one that implies our differences will be managed but separateness can no longer be tolerated. Exopolitics is playing-on-words for what technoscience has amplified into an urgent rejoinder for settling our international disputes and globalizing the planet once and for all. So, do other-world aliens exist among us? Elaine Pagels, Princeton professor known for The Gnostic Gospels which proposes the origin of Christianity in gnosticism, says, “..what exactly is ‘Gnostic’ is a real open question… I’ve come to the conclusion that what we call Gnostic is a wide range of sources.” http://www.realitysandwich.com/gnostic_interview_elaine_pagels No one claims to know the source of its emergence but Wikipedia suggests “Gnosticism was primarily defined in Christian context.. until Moritz Friedländer (1898) advocated Hellenistic Jewish origins, and Wilhelm Bousset (1907) advocated Persian origins. Consequent discussions of Gnostic Christianity included pre-Christian religious beliefs and spiritual practices argued to be common to early Christianity, Hellenistic Judaism, Greco-Roman mystery religions, Zoroastrianism (especially Zurvanism), and Neoplatonism.” http://en.wikipedia.org/wiki/Gnosticism There are “traditional Gnostic Satanists” too of course, who “view Satan..as the bestower of gnosis (knowledge, insight)..” http://www.freewebs.com/gnosticsatanist/ Pagels adds, “In the collection that was found at Nag Hammadi you’ve got something..[that] looks like it’s influenced by Buddhism.” So, Gnostic Pagans? –hey, why not. They’re the Green Gnostics –they’re here and they’ve brought their War in Heaven with them. If the X-Files hadn’t been canceled, these guys wouldn’t have to ask. The definition of belief from my Webster’s is “1) a state or habit of mind in which trust or confidence is placed in some person or thing, 2) a tenet or body of tenets held by a group, and 3) conviction of the truth of some statement or reality of a fact especially when well grounded” –okeedoke? For the record, I believe in a high probability of life in our galaxy similar to Earth. I didn’t start this post to denigrate space-alien believers. In fact, the promoters of aliens mentioned here do that themselves by exploiting and debasing assumptions about life in the universe and the common language we use to give it meaning. Spirituality is objectively recognized by all societies as a quality of being human and it’s that pervasive reality abused by “manipulative extraterrestrials” as a taproot for mind control. Heuristics are information-generating techniques “to guide, discover, and reveal” (ref.Webster’s) such as those used in computer modeling and sociology. 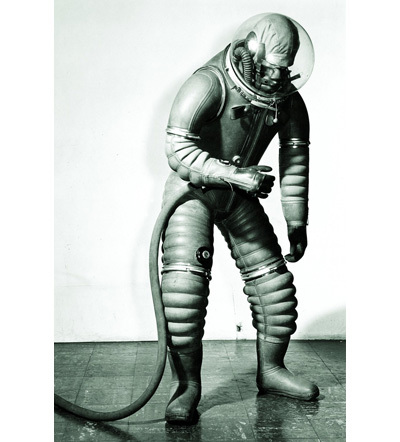 prototype spacesuit called Mark 1 “Tomato Worm”; this pressure suit was made by B.F. Goodrich and tested between 1940-1943. While I think Max Igan has made an important film with Trance-Formation in apprising us of the danger posed by technology, it’s still playing with the classic Gnostic memes, offering a “child’s choice” between good and evil. One has to accept the idea that a human becomes divine by conscious exploration. Igan, Lipscomb, Icke, and others suggest we choose “good”, not because we ARE good but because we must choose –an affect, in this meme, of the primal split in the Godhead. Trance-formation opens with a quote that echos the belief of Hans Jonas: man himself is the origin of all common evil, and no event in our known history was more intentionally designed to force the Choice between good and evil than the creation of atomic weapons. Except maybe invasion by Aliens. “War of the Sons of Light Against the Sons of Darkness” is a title given to one of the first seven Dead Sea Scrolls acquired by the Hebrew University of Jerusalem. “This kind of apocalyptic sensibility was a discernible strain of Jewish thought at the time of Jesus… Armageddon: the war to end all wars… inevitable conflict [as] the final focus on the dark side of human nature, the ultimate catharsis that ushers in an age of peace.” http://www.pbs.org/wgbh/pages/frontline/shows/religion/portrait/scrolltranslation.html According to wikipedia, the War scroll was published in 1955, seven years after the discovery of the DDS was announced in April of 1948. 1955 was the year of H-bomb detonations in the U.S., no longer ‘experimental’, mass distribution of the first global vaccine, the Salk IPV, and a newly operating nuclear reactor (Soreq) in Israel. The “free air” of earth no longer exists. “The first lines of the [War] scroll lay the framework for a three-stage conflict between the Sons of Light..and the Sons of Darkness… the writer of the scroll was particularly concerned with..the very final day of battle.. [and] built his encouragement on a biblical theology of rescue… Coupled with this aspect was his understanding that great suffering was part of God’s will for the redeemed… Ultimately, God’s purpose was to exalt the Sons of Light and to judge the Children of Darkness. The message is one of hope… God was preparing to intervene and bring a permanent solution for the problem of evil. …Many thinkers are able to see the clear connection between the Nihilist philosophy that reduces reality and human nature to the simplest possible terms, and a Nihilist practice that similarly reduces the concrete man; not a few, also, realize the seriousness and the radicalness of this “reduction” even to the extent of seeing in it, as does Erich Kahler, a qualitative change in human nature. “(The) powerful trend toward the disruption and invalidation of the individual … manifestly present in the most diverse currents of modem life–economic, technological, political, scientific, educational, psychic and artistic–appears so overwhelming that we are induced to see in it a true mutation, a transformation of human nature. …What, more realistically, is this “mutation,” the “new man”? He is the rootless man discontinuous with a past that Nihilism has destroyed, the raw material of every demagogue’s dream; the “free-thinker” and skeptic, closed only to the truth but “open” to each new intellectual fashion because he himself has no intellectual foundation; the “seeker” after some “new revelation,” ready to believe anything new because true faith has been annihilated in him; the planner and experimenter, worshipping “fact” because he has abandoned truth, seeing the world as a vast laboratory in which he is free to determine what is “possible”; the autonomous man, pretending to the humility of only asking his “rights,” yet full of the pride that expects everything to be given him in a world where nothing is authoritatively forbidden; the man of the moment, without conscience or values and thus at the mercy of the strongest “stimulus”; the “rebel,” hating all restraint and authority because he himself is his own and only god; the “mass man,” this new barbarian, thoroughly “reduced and “simplified” and capable of only the most elementary ideas, yet scornful of anyone who presumes to point out the higher things or the real complexity of life. These men are all one man, the man whose fashioning has been the very purpose of Nihilism. But mere description cannot do justice to this man; one must see his image. And in fact such an image has quite recently been portrayed; it is the image of contemporary painting and sculpture, that which has arisen, for the most part, since the end of the Second World War, as if to give form to the reality produced by the most concentrated era of Nihilism in human history. The human form, it would seem, has been “rediscovered” in this art; out of the chaos of total abstraction, identifiable shapes emerge. The result, supposedly, is a “new humanism,” …But what kind of “man” is it to which this art has “returned”? It is certainly not Christian man, man in the image of God, for no “modern” man can believe in him; nor is it the somewhat diluted “man” of the old humanism, whom all “advanced” thinkers regard as discredited and outmoded. It is not even the “man” disfigured and denatured in the earlier “Cubist” and “Expressionist” art of this century; rather, it begins where that art leaves off, and attempts to enter a new realm, to depict a new man. …little reflection should be required to penetrate to the secret of this art: there is no question of “man” in it at all; it is an art at once subhuman and demonic. It is not man who is the subject of this art, but some lower creature who has emerged (“arrived” is Giacometti’s word for it) from unknown depths. See comment 4, Race to Space about Robert Goddard, Charles Lindbergh, Harry Guggenheim, Carl Jung, Jack Parsons and L.Ron Hubbard. …While it is quite difficult to set upper limits to ‘natural’ human physiological and psychological performance, we can take as minimal the capabilities demonstrated under control conditions such as yoga or hypnosis. The imagination is stretched by the muscular control of which even the undergraduate at a Yoga College is capable, and hypnosis per se may prove to have a definite place in space travel, although there is much to be learned about the phenomena of disassociation, generalization of instructions, and abdication of executive control. We are now working on a new preparation which may greatly enhance hypnotizability, so that pharmacological and hypnotic approaches may be symbiotically combined. Radiation Effects. One subsystem of the Cyborg would involve a sensor to detect radiation levels and an adaptation of the Rose osmotic pump which would automatically inject protective pharmaceuticals in appropriate doses. Experiments at the AF School of Aviation Medicine already indicate an increase in radiation resistance resulting from combined administration of aminoethylisothioronium and cysteine to monkeys. CHG: Why exactly did you guys decide to write about space travel? MC: Nathan Kline was the director of this research facility there at the Rockland State Hospital and one day somebody asked him… Dr. Kline was interested in the application of drugs for the treatment of mental patients. CHG: Yeah, he was with NASA. CHG: I noticed you used the term participant evolution in that article. …I have to criticize a little what seems to be a great lack of appreciation of molecular biology among cyborg studies. The great things that are happening today in the scientific world are advances in molecular biology along with computers. Those are the two regions of our scientific world that are growing very rapidly, and compared to them psychology is dead in the water completely. It is already known that the emotional world of men is fashioned through molecules like neuropeptides… These peptides have receptors scattered throughout the brain..[and] it is known that the emotional world can be affected now by designer molecules. That’s where the computers and molecular biology will intermarry… computer-designed molecules..that will naturally work inside the brain and will be able to change the emotional aspects. …They continually are making gene products, some are turned off, some are turned on…So that by controlling and knowing how to control the natural products, and turning the genes on and off, we will have tremendous power to change the emotional world of man.